Buy through MusicWeb for £12.50 postage paid World-wide. 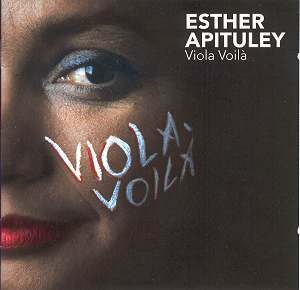 Viola Voilà from violist Esther Apituley follows close on the heels of her first release Violent Viola (see review) for Challenge Classics, the Netherlands based independent record label. I was so impressed with Apituley’s excellent playing on Violent Viola that I made the recording my joint ‘2006 Record of the Year’. Viola Voilà is an eclectic collection of scores by eight composers featuring the viola as a solo instrument either in the original versions or Apituley’s own arrangements. The scores range from the early nineteenth century classical elegance of Schubert’s Arpeggione Sonata for viola and piano, to Vieuxtemps’s Romantic Capriccio for solo viola to John Cage’s avant-garde Dream for viola quartet and piano. Also included on the release is Esther Apituley’s own composition Hydropath for viola quartet, electric bass and trumpet. This release showcases the considerable talents of the Amsterdam born Esther Apituley. She started playing the violin at the age of twelve, soon switching to the viola. After graduating from the Amsterdam Sweelinck Conservatory, Apituley took lessons at the Hochschule Für Musik in Berlin. During her early studies, she was also active as a singer and saxophonist in the field of light music. The versatile Apituley currently teaches viola at the Amsterdam Sweelinck Conservatory. In 1990 Apituley gave her first solo viola recital in the Concertgebouw, Amsterdam. With her enthusiastically received performances she has gone some way to refute the prevailing image of the viola as a mere voice in the middle range, destined only to serve others. Apituley has played as a soloist with the National Ballet Orchestra, North Holland Philharmonic, Metropole Orchestra and the Radio Chamber Orchestra. Her broad repertoire includes the viola concertos by Berlioz, Bartók, Chiel Meijering, Mozart’s Sinfonia Concertante for violin and viola, K364 and Britten Lachrymae. She tells me that she has also performed the Frank Bridge Lament for two violas and the York Bowen Fantasie for four violas with the Amsterdam Viola Quartet. Apituley has worked tirelessly to bring the viola out from under the shadows cast by the violin and cello. Her main priority is to present programmes that are characterised by their originality, versatility and accessibility to the audience. In 2000, Apituley founded the Amsterdam Viola Quartet who place emphasis on distinctive performance presentation and their eclectic repertoire consists of contemporary and established classical music along with tango and contemporary styles. The opening work is the Schubert Arpeggione Sonata composed in 1824 for the now obsolete instrument called the arpeggione. The arpeggione, a six string instrument that was similar in shape, tuned and fretted like a guitar and played between the knees like a cello with a bow, did enjoy a brief vogue for a decade or so after its invention around 1823. Her viola and piano arrangement of the substantial twenty minute Arpeggione Sonata displays what a remarkable player and interpreter she is as she questions the commonplace and is not afraid to take risks. In the swiftly taken opening movement Apituley and Tanaka provide the perfect fusion of tenderness and fervour, strongly emphasising the highly rhythmic, dance-like quality of the score in a highly individual interpretation. The playing from the duo in the adagio has a reverential quality that borders on the spiritual and the rondo, finale is vivacious and overflowing with a spring-like joy. Throughout the work the players accentuate key notes and phrases, and adopt brisker tempos than one usually hears, however, they are judiciously chosen to suit the viola. The least known composer on the disc is probably the Padua-born Richard (Riccardo) Drigo who is best known as a conductor of the Italian Opera in St Petersburg and conductor and composer to the Imperial Ballet. Drigo gave the first performances of Tchaikovsky’s Sleeping Beauty and Nutcracker, and Glazunov’s Raymonda. Drigo is acknowledged principally for his ballet compositions and his brief score Valse Bluette is presented here in the arrangement for viola and piano by Jascha Heifetz. Apituley and Tanaka confidently provide a good humoured performance in this attractive dance-infused Drigo score. The Belgian Vieuxtemps is best known as an eminent virtuoso violinist whose playing was compared with that of Paganini in some quarters. He was also an exponent of the viola and around 1883 he composed his short Capriccio for solo viola. There is confident playing from the impressive Apituley. The unsettling angst of the Capriccio is a profoundly moving experience and a highlight of this release. The American composer John Cage was one of the leading figures of the post-war avant-garde who with his pioneering and controversial works made a significant impact on twentieth century music. Cage’s Dream is performed here by the combination of viola quartet and piano in Apituley’s own arrangement. Dream is a substantial, still and chilly score that in this performance evokes a picture of a solitary figure castaway on an Arctic glacier. Stravinsky’s Èlègie was a commission in 1944 from Germain Prevost, violist of the Pro Arte Quartet, in the memory of quartet founder member Alphonse Onnou. The Èlègie, a short lamentation lasting around five minutes, is the only score Stravinsky composed for solo viola. Apituley’s interpretation of the Èlègie, with its curious repetitive quality, provides an abundance of sorrow combined with intense elements of yearning and regret. Apituley in the booklet notes writes about a fantasy world with beasts called Hydropaths from the Polar regions that are made of snow and ice with eyes like multi-coloured pearls. Apituley’s own score Hydropath written for Hans Dagelet's music theatre piece of the same name uses the unusual instrumentation of viola quartet, electric bass and trumpet. It is a fascinating and inventive score with a mechanical-like repetitiveness that opens with spiky and steely assertiveness. From 3:14 with the introduction of the electric bass and prominent jazzy trumpet we experience an increase in intensity, adding a hot, sultry and heady atmosphere to the proceedings. Fauré’s Berceuse for violin and piano was first performed in Paris at the Société Nationale de la Musique in 1880. The highly popular work, arranged here for viola and piano, is often performed in a version for violin and orchestra. A short work, it is highly concentrated in mood with a limited emotional range. No hints of a slushy lullaby here and the temptation to linger is resisted - a remarkably calm and pleasantly sophisticated interpretation. Astor Piazzolla and the word tango are synonymous, controversially developing the music that had evolved in the underclass of Argentina society; namely the seedy back-street bars and bordellos of the seaports, Buenos Aires and Montevideo. Le Grand Tango was a commission by the Russian cellist, Mstislav Rostropovich, premiered in 1990 in its original form for cello and piano. Apituley and Tanaka perform Le Grand Tango here in Piazzolla’s own version for viola and piano. Piazzolla gradually builds up the intensity in the score which does not spark into life until 7:43 with the duo casting aside the prevailing mellowness and delivering a large injection of spine-tingling excitement. The Challenge Classics engineers have provided a vivid and detailed sound quality with an excellent balance. The rather carelessly edited booklet, with the exception of short essays from Esther Apituley and Jacco Mijnheer, contained only the barest of information on the actual scores. Viola Voilà achieves the same level of excellence as her successful release Violent Viola. Esther Apituley is a remarkable viola player and this fascinating recording is essential chamber music listening.